Super Aleste (Space Megaforce in North America) is a vertical-scrolling shooter video game, published by Toho and part of the Aleste series by Compile. 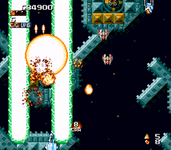 In a traditional fashion, the player pilots a space ship through a variety of locales crawling with enemy squadrons to shoot down, though the story in the Japanese version is different from American and European ones. However, Super Aleste also offers a "Short Game", where only a set of small levels are played, with the emphasis on scoring as many points as possible. Source: Wikipedia, "Space Megaforce", available under the CC-BY-SA License.